Yesterday, I featured some Sookie Stackhouse inspired Halloween costumes. Since then, I’ve been thinking some other cool, book-inspired costumes. Here’s what I came up with, please leave me a comment and let me know your ideas for literary costumes! Waldo:This is a super easy costume. All you really need is a pair of glasses, a white shirt and beanie with a red marker. The big pro of this outfit is that almost everybody will recognize you. The con is that you will probably get sick of peopling pointing at you yelling “He’s over there”! Liz From Eat Pray Love: This is a costume that not everyone will get but I think it would be a fun concept. All you need is a glass of wine, a pizza, prayer beads, and a yoga mat. If people don’t get your costume, who cares? Have some pizza, drink some wine and enjoy your night! Harry Potter: This is an obvious one. You can find a good ole’ HP costume at any major costume shop these days. 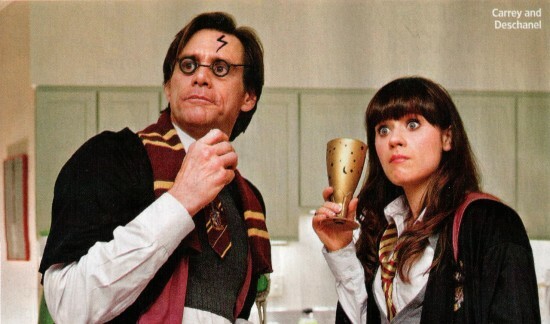 If money is tight all you really need is some glasses, a wand and a lightening bolt scar. Katniss Everdeen: Pay tribute to this tribute from District 12 by going as Katniss from the Hunger Games series. Carry a bow and arrow for an added touch. If you want to get fancy, fashion yourself a flame-print dress and go as Katniss on her way to the opening ceremony. Sookie:What I like about this costume is that it’s fairly easy. Every girl is a blond wig, white shirt and a pair of black shorts away from being our favorite vampire-loving waitress. Put a couple fake bite marks on your neck for some extra authenticity. Also, consider sporting a red wig and going as either Arlene or Jessica. TAGS: Dr. Suess, Eat Pray Love, Harry Potter, Katniss Everdeen, Katniss Everdeen Costume, Sookie Stackhouse, Where's Waldo?